The new real estate complex called "Lo Mayen" is the first mountain building with a totally domotic system with high-performance accommodation both from the point of view of acoustic and thermal insulation with a consequent very low cost of management with certificate of energy performance A4, the maximum that can be obtained. 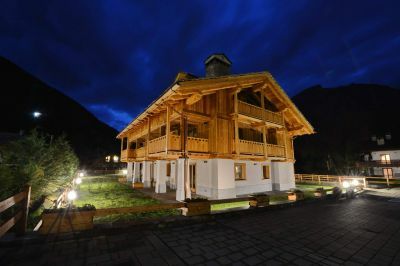 The building, whose construction work was completed on 20.06.2018, is located in a strategic position just 300 meters from the ski lifts that lead into the vast ski area of La Thuile, which is spread over about 200 km of slopes various difficulties and with a single international Skipass, which through the Piccolo San Bernardo pass connects with the French ski resort of "La Roisere", specifying that from the winter season 2018/2019 two new chairlifts are in operation and are added to the already existing plants, the departure station of the first chairlift called "Moulins" is near that of the Du Fort plant at an altitude of 1950 meters approximately with arrival at 2400 meters, while the second "Mont Valaisan Express" plant is in sequence to the previous one and will reach the 2800 meters of altitude in a very snowy area. The two new ski lifts are accompanied by 5 new ski runs along the Valaisan valley in an open area, with a wide range of off-piste itineraries on the French side as well as ski mountaineering routes to Italy.